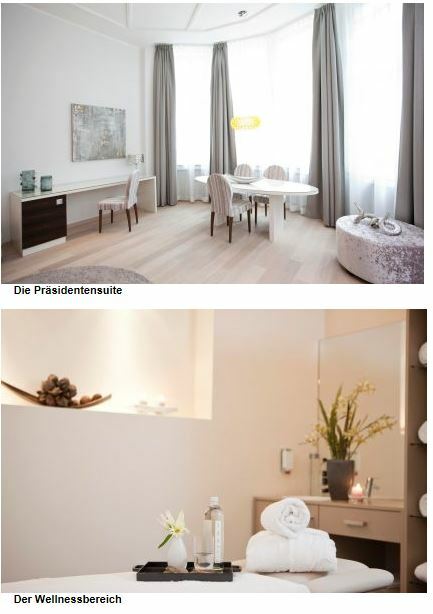 Ano­t­her pri­ma­ry buil­ding pha­se in the Grä­f­ra­ther Hof hotel has been suc­cess­ful­ly com­ple­ted. High­ly exclu­si­ve sui­tes were crea­ted in mid‐May 2010. The Juni­or, Supe­ri­or and Delu­xe Sui­tes offer ple­nty of living space for pri­va­te retre­ats. Inte­rior, qua­li­ty mate­ri­als and attrac­tive design ele­ments give a fee­ling of rela­xed luxu­ry and meet the hig­hest demands of design and style. Indi­vi­du­al luxu­ry bathrooms with sepa­ra­te show­ers and baths com­ple­te the com­forts. Live like a pre­si­dent! A stay beco­mes a real event with the uni­que pre­si­den­ti­al sui­te. Restrai­ned colours blend per­fec­t­ly with selec­ted inte­rior ele­ments. Bright ambi­ence lends it an ups­ca­le atmo­s­phe­re. The impres­si­ve bathroom has fit­tings of the hig­hest qua­li­ty, polished gra­ni­te and a com­ple­te­ly pri­va­te sau­na as a real­ly spe­cial fea­ture. XXL TV, air‐conditioning and WiFi are of cour­se inclu­ded. Bet­ter qua­li­ty of life through health and fit­ness! Let our per­so­nal trai­ner coach you in the effi­ci­ent and tar­ge­ted used of the most up‐to‐date machi­nes. Elec­tro mus­cle sti­mu­la­ti­on for fast weight‐loss, indi­vi­du­al nut­ri­tio­nal advice, Pila­tes and a gre­at choice of holistic mas­sa­ge pro­ce­du­res com­ple­te our port­fo­lio.